Two Parkland shooting survivors are no longer surviving. A father of a Sandy Hook victim took his life this past week as well. These are the very real and present dangers of Post Traumatic Stress Disorder that affect anyone who has suffered a trauma directly or peripherally. My first introduction to PTSD occurred back in 2004 when I was contacted by a man and his wife who wanted help telling their story. Their therapist thought writing might help them both recover from the debilitating effects of PTSD. They found an article I’d written in a magazine in the doctor’s office and gave me a call. The first time they called, they were tentative and wouldn’t even tell me what had happened to them that had left them traumatized. I met with them at a coffee shop. They were reluctant to talk. So, I did what I sometimes do when I’m nervous. I chattered. I told them about my life which had taken a major hit in the past three years. Something about my honesty made them trust me, and they told me their story. As I listened to their tale, I realized I too had been suffering from PTSD symptoms ever since the murder of my two great nieces by their mother in 2001. I wrote the book for Brent and Barbara Swan and went through their horrific experience with them, which helped us all. Brent had worked for Chevron in the 1990s as a helicopter mechanic. He was stationed in Angola . He’d do six weeks on and six weeks at home. There was a small faction who’d formed an unrecognized government because they wanted the proceeds from the oil production to come to them. 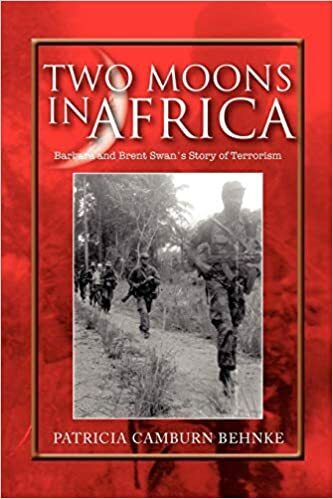 One morning as Brent drove to the airfield, he was kidnapped by the rebel government and held hostage for sixty days or “two moons” as he viewed his time in captivity. The U.S. government had strict guidelines about not negotiating with terrorists. Chevron had to work on his release undercover. The rebels loved Brent because he acquiesced and was a good prisoner even though they loaded up their AK-47s each morning next to his bed so he could never forget he was a hostage. When the release was negotiated, the rebels gave Brent an honorary citizenship certificate with all their signatures. They gave him a map of all their camps, and group photos with their hostage. Brent turned it all over upon his release to the authorities. And nothing happened. No arrests. Nothing. Brent came home and resumed a life as normal as he could. Six or seven years passed and 9/11 happened. Then all of a sudden the U.S. government became intent on bringing all known terrorists to trial. They started with the head of Brent’s kidnapping team and then the feds called Brent and told him he was the star witness. Brent and his wife Barbara went into full survival mode PTSD when he had to travel to Washington, DC, and face his kidnapper and testify. Brent fell apart at the trial and afterwards. Barbara didn’t fare much better. When I met them in 2004, they were struggling to pull themselves out of the trenches of psychological warfare. After that initial meeting, I didn’t hear from them for more than a year. Then I wrote their book, Two Moons in Africa (Patricia Camburn Behnke). Today I’m happy to say they are better but still living with the quirks that come from the PTSD. My PTSD reasserts itself in times of stress or sometimes just because it can. In the past, I’ve dealt with it by writing about things other than the trauma I experienced back in 2001 and 2002. But this winter when it returned with panic attacks and depression, I decided it was time to write about how the deaths of loved ones has had an impact on me and how I cope with life’s irregularities. So far, my own self-imposed therapy is working. I will have to finish the book before I decide if I’ll publish or not. It might turn out i’m simply writing for myself unless I see benefit to others going through similar situations. As the news of the suicides hit this week , I considered what we can do to help those who suffer after trauma. Staying silent is not an option. Here’s a few things without even researching or digging very deep. If someone doesn’t show signs of trauma after an event, it doesn’t mean she isn’t feeling isolated and alone in her fear, paranoia, grief. Without being a pest, keep her on your radar with calls, texts, cards, and/or visits. Any acts of reaching out to show her she isn’t alone may be just the thing they need. Let him talk about the tragedy if he brings it up. Too many times if I tried to talk about the murders, others changed the subject. One person has told me several times he can’t deal with hearing about it because it’s too sad. Other people tell me they don’t want me to get upset by talking about it. It’s upsetting when it’s ignored, and we all should remembered that. Each of us has our own timetable for grief and mourning. Do not attempt to dictate what you believe to be the proper time for someone to be over “it.” It only makes the grieving person feel as if something is wrong with her. Don’t discount how a traumatic event has affected another person. Soon after I returned to work after the murders, a co-worker said to me, “Why are you so upset? It didn’t happen to you.” That set me back in my healing process by years. I still hear that voice in my head in the worst of times. There are more I’m sure, but those are the immediate ones. Share any others you might have by leaving a comment. It can only do good because the alternative only creates another opportunity for PTSD to take hold of another life.